Showcasing sleek fine lines, modern, elegant décor and contemporary artwork, the tasteful Aria River ships offer style and comfort at every turn. With a thoroughly boutique feel, these river boats are home to a limited number of guests. The staff-to-guest ratio of almost 1:3 will ensure you receive exemplary service on every leg of your journey, so guests can enjoy luxuriously comfortable cabins, spacious social areas and multiple dining options while sitting back and watching the enchanting landscapes drift idly by – bliss! With a host of stylish and sophisticated communal areas, the Aria River Ships ensure that guests who plan to get to know their fellow passengers have ample opportunity to do so. Early risers can head to the Sun Deck and make use of the heated pool as the sun rises (or at any other time of day) before heading to the ambient Showroom to enjoy one of the many fascinating presentations and performances. The Observation Lounge ensures guests don’t miss a moment of fantastic scenery as they watch the world sail by and chat with fellow guests. With an impressive staff-to-guest ratio, passengers will always feel truly pampered on board the Aria River Ships. Alongside the warm and welcoming hospitality team (who will always be happy to prepare you something delicious to eat or a cocktail, just the way you like it). The crew also includes English-speaking locals, historians and lecturers. These knowledgeable specialists will be ready to advise you on all of the best hidden gems to ensure that your onshore excursions are just as special as your time on board. Why Cruise on Aria River Ships? With spacious cabins boasting luxurious queen-size beds, well-appointed bathrooms and panoramic balconies in 82% of the rooms, the Aria River Ships offer some of the finest accommodation on Europe’s waterways. Guests can expect a host of luxury amenities, including five on-board restaurants and a well-equipped fitness and wellness area. 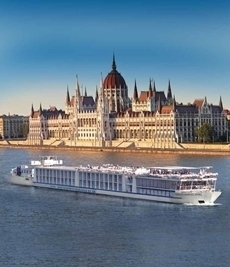 Itineraries include an 8-day trip, which launches at Bordeaux and takes in stunning wineries and gastronomical delights, and a 15-day ‘Magnificent Europe’ cruise from Amsterdam to Budapest. Whichever one you opt for, get ready for the trip of a lifetime.